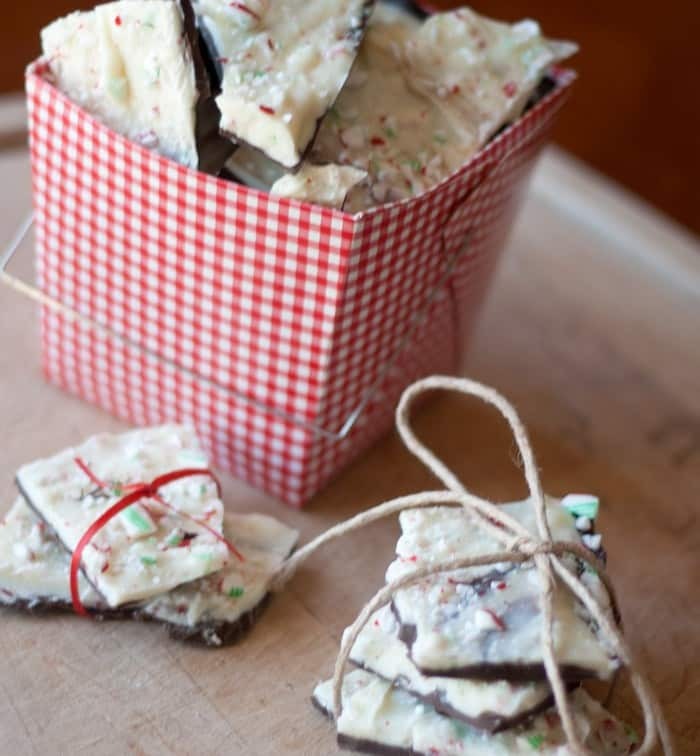 Dark Chocolate Peppermint Bark. HELLO! These two sweets combined are pure perfection. And they make for a cheery holiday presentation too. Think homemade gifts for Christmas or gift giving throughout the holiday season. This treat is super easy to make. Add in 1-2 drops of peppermint oil for an amazing flavor! When wondering where to by peppermint oil, I looked on Amazon first and found a great deal. Don’t forget that when you sign up for Amazon Prime, you get free shipping on Amazon Prime qualified purchases. This has saved me a TON of money this year alone, not to mention the other great benefits of Amazon Prime, like all the amazing movies and television shows I can watch for free, and free cloud storage. You can even get a 30-Day Free Trial on Amazon Prime! The other day I was standing in line at Walgreen’s and eyed the yummy Ghirardelli display and couldn’t help but take a second look at their dark chocolate peppermint bark bar. It looked SO good. I managed to pass it by without adding it to my purchase, but I sure thought about it. Instead, I made a stop at the grocery store and bought some dark chocolate chips, white chocolate chips, and found my stash of candy canes. Hello yummy Copycat Ghiradelli! Let me tell you, if you’re into making super simple holiday treats that don’t take a lot of time to make and look absolutely stunning, this is a perfect treat to make. It’s no-bake, takes seriously about 10 minutes of active work time (if that!) and packages up in such an attractive way that is perfect for teacher gifts, neighbor gifts, or for anyone else you’re gifting to this holiday season. Double, triple, quadruple- because this recipe is a proven winner. In fact, I’m eating some right now… testing it out for the third day in a row and I will be making a few more batches to share with friends and family in a couple more weeks. It’s that good! EASY. Super simple… that’s all there is to it. Think about it. You’re making treats with your family, or maybe you’re making treats alone… either way, it doesn’t have to be time-consuming. Just take time to enjoy making memories and holiday traditions and enjoy all that is the holiday season. Whether you’re making an apple pie for Thanksgiving, Cream Cheese Danish for Christmas morning, or putting together a Gingerbread House decorating party… remember to take time to make and cherish the memories that are being made. And give a gift of love and thoughtfulness. Remember, that’s what gifting should be about. 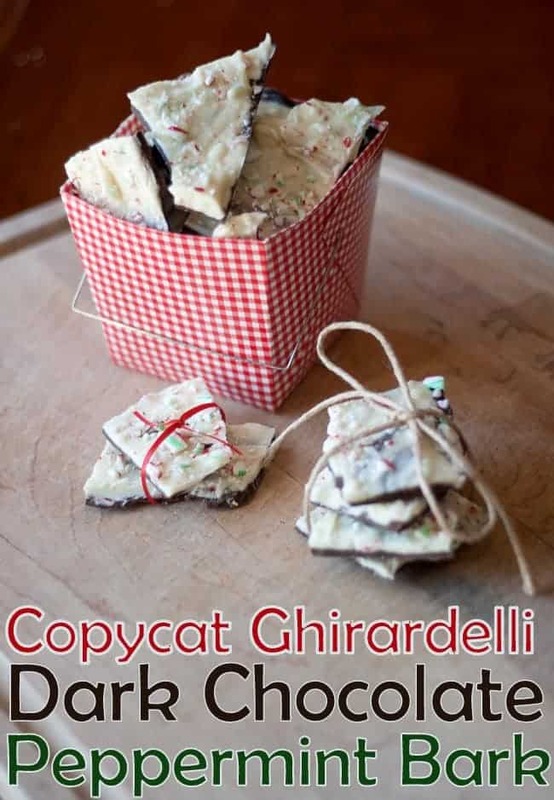 I sincerely hope you enjoy our De.Li.Cious Copycat Ghirardelli Dark Chocolate Peppermint Bark. It’s an easy treat to make, and as long as you don’t eat it all up yourself, there should be plenty in just one batch to make a few gifts out of it. Melt dark chocolate chips in a glass bowl in microwave. Microwave for one minute, stir and then microwave again for 30 seconds at a time until chocolate is melted. Pour dark chocolate on Silicone Line Baking Mat or parchment paper lined cookie sheet and spread evenly. Place in refrigerator until mostly hardened, and then remove for next layer. 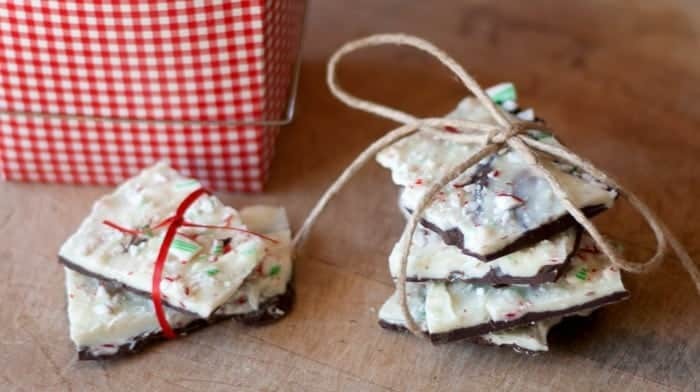 Crush peppermint candy canes and melt white chocolate chips. Mix all but 1/4 of the crushed peppermint in with the melted white chocolate. Spread white chocolate over the dark chocolate, as evenly as possible. Sprinkle remaining crushed peppermint over the white chocolate. Once candy has hardened, lift the paper up off the cookie sheet and either cut or break apart. Put in a candy tin, or package in gift bag or boxes for gifting. When do I add the peppermint oil? good question. it’s not in the recipe, but i’m assumig with the dark chocolate since it’s the only part of this recipe without peppermint. Would you please tell me what brand dark and white chips you used? I have had issues in the past with certain brands not melting properly..
I’ve used Ghirardelli chips before with no problem. I’ve only ever experienced issues when trying to melt some white chocolate chips. I’ve found that adding a little bit of vegetable oil into the white chocolate helps to alleviate the problem. You heated the white chocolate too quickly, and it seized.. It really needs to be melted over a double boiler and tempered with the last bit of saved unmelted white chocolate. Can I use peppermint extract instead of oil? You can. You might need to adjust the amount a little depending on taste. I was looking for a Ghiradelli Pepermint Bark recipe and found yours, but you used candy canes. The reason the Ghiradelli one is so good is that they infuse corn flakes with peppermint oil and red color- that’s why their chocolate doesn’t get stuck in your teeth. Any ideas on how to do this?